I am still working on eggplant. I have been making great progress since I theorized that the trick is to make sure it is well cooked. And my latest experiment continues to support my thesis. 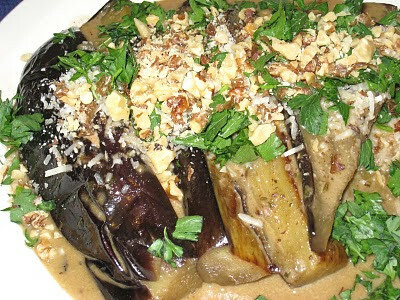 Braised eggplant is soft and silky, with a deep, almost smoky flavor. When combined with Marsala, it develops a velvety, luxurious umami richness that is insanely good. Add a topping of chopped toasted walnuts and fresh parsley and it is pretty near Nirvana. This would make an excellent side dish for any dish, meat, poultry, or seafood. It packs a wallop of flavor for little effort. You may notice that there is grated cheese on top of the photo. It makes for a prettier dish, but to my taste it overpowered the rest of the ingredients and I regretted using it. I left it off of the recipe, and I would strongly suggest that you do, too. touching until well browned, about 5 minutes. Turn the pieces and cook another 5 minutes, until they are also well browned. Add the chicken stock, wine, salt and nutmeg. Lower the heat to a simmer, cover the pan, and cook for about 30 minutes, until the eggplant is silky and almost falling apart. eggplant. Garnish with the parsley and walnuts and serve immediately.